During each election cycle we hear about the elusive independent voters, who are apparently the deciding voters of every election. But what do we actually know about their importance or the best way to reach them? There has been an argument recently that both parties have been neglecting their swing voters and instead of trying to persuade these swing voters, have focused their efforts on much more involved voters. Secondly, more often than not, independent voters have a very strong dislike for political parties and partisan players, and the next thing that sets independents apart would be that they are indifferent to any and all political parties and their affiliates. Finally, independent voters could be classified as being inconsistent. Independents might vote Democrat during one election and then Republican the next. There is a case to be made for saying that the Independents who lean Republican are different from the Independents who lean Democrat. According to Zachary Cook’s research in “The Younger, More Independent Republican Leaner,” he argued that this was because independents who leaned toward the GOP were less economically conservative than the party, and thus felt more cross pressure than independents who leaned toward the Democrats. Even though independent voters are more likely to pride themselves on thinking outside of the box, it is interesting to note that according to a study done in 2012 by the Pew Research Center, independents are less likely to be informed when it comes to what is happening in the world of politics. Partisans are your most reliable voters, but are many independents closet partisans? What is the difference between independents who lean toward the Democratic Party, and those who lean toward the Republican Party? Is the number of self-described independents increasing and if so, at which party’s expense? Do independents pay less attention to politics? Voter Gravity Trains on Campaign Tech at #CPAC2016! With the early states’ ballots already counted and Super Tuesday fast approaching, there’s no question that the 2016 election is in full swing! If you’re tired of sitting on the sidelines and want to get involved, then you won’t want to miss the CPAC 2016 Activism Boot Camp, featuring Voter Gravity! Many Thanks to our 2014 Clients! 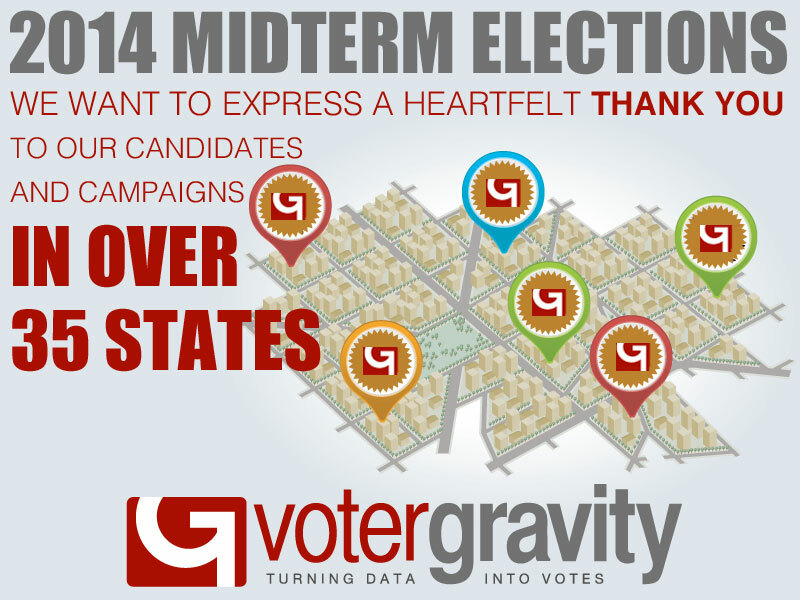 Voter Gravity is proud to provide demographic & lifestyle data from Esri. Voter Gravity has integrated Esri Tapestry Segmentation into our Esri base maps. Esri Tapestry Segmentation combines of all the possible demographics you may encounter — whether you live in an Urban city or a rural area. They break six main categories into 65 different segments. At its core, Voter Gravity is a tool to help campaigns build relationships with voters. Whether that’s a conversation at the front door or over the phone, the goal is to help campaigns connect to the right voters with the right message via the right medium. Today, we’re excited to announce a new way to connect with voters: Facebook. 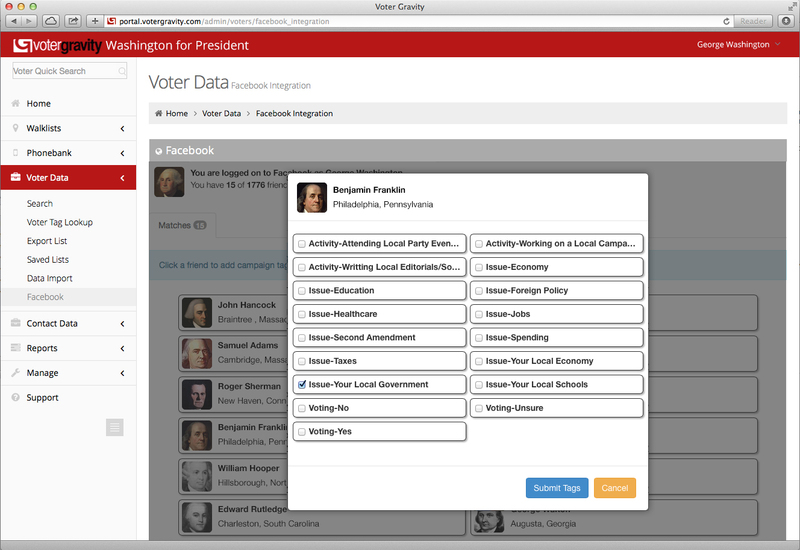 If you are using Voter Gravity at any level, from candidate to volunteer, you can now connect to your personal Facebook account and see which of your friends are registered voters in the district.After Voter Gravity scans and matches your Facebook friends, if you know a friend is passionate about a specific issue, or supports a certain candidate, you can tag them right there within Voter Gravity. It’s another way that you can leverage our battle-tested platform to connect with more voters, build better relationships, and win more elections. If you’re a current user, the Facebook portal is available right now. Haven’t seen Voter Gravity lately? Might be time to take it for a spin. Lots of new changes to Voter Gravity this summer. Check out the new integration with Esri maps and the ability to select up to 25 walk lists in this new video hosted by our CEO, Ned Ryun.